A pillow and throw blanket for Sofia the First fans. The 50″ W x 60″ L blanket and 12″ x 12″ pillow come in a matching 13″ x 13 1/2″ tote for easy portability. Ages 3 and up. Polyester. Blanket, machine wash; pillow, spot clean. Imported. Only $39.99. Click Here to shop. Also available at shop.avon.com, Sofia Cuddle Pillow, If you know a princess-in-training who deserves the royal treatment, then look no further! 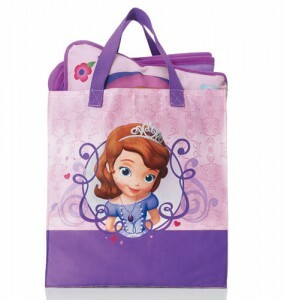 TV’s most popular princess, Sofia the First is now a 28″ H cuddle pillow for little ladies to hug and play with all day. Plush and fabric. Imported and Sofia Light-Up Watch. Press the lid on the Sofia the First watch face to display multi-colored LED flashing lights. Lid opens to reveal digital time and image of Princess Sofia and Princess Amber. This exclusive watch design is only available at Avon. 8 3/4″ L. Ages 6 and up. Plastic. Imported.